The L-200Si is designed to be integrated into building-wide fire alarm systems and their local signals are remotely initiated, either automatically from detectors in the system or manually from pull-stations spread throughout a facility when so initiated by the system’s fire panel. These hard-wired LinearStrobes are designed to be hard-wire connected to a building’s fire alarm system’s notification appliance circuitry (NAC) and are similarly configured to the system like other visual notification appliances like emergency strobes and horn-strobes. Most LinearStrobes are designed to be installed/recessed into (or over) a single gang or double gang outlet box whose lettered cover plate can either denote the exit “here” with a down-arrow or which can denote which direction one should take to reach the nearest exit with a left-arrow, right-arrow or up-arrow as the specific location might command. The easily retrofitted I-LinearStrobe devices can be field-calibrated to different light intensity settings and all I-LinearStrobes flash in synchronization with the other visible notification appliances in the same room and/or field of view. Typical LinearStrobes are calibrated by the manufacturer to flash at a 1Hz flash pattern or a pattern identical to the other visible notification appliances that it is synchronized with in the zone or field of vision. 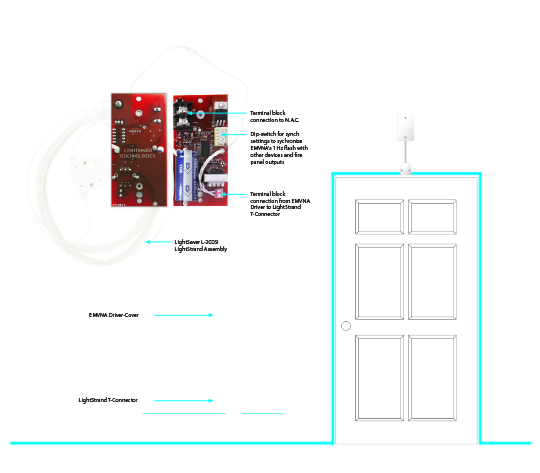 In a fire alarm notification appliance circuit, the I-LinearStrobe device is automatically triggered with the NAC, like other notification appliances, to immediately light the periphery of an exit door and/or highlight the path or points of egress with its two linear luminaries. In a security system, the device can be configured to activate per the security system’s control panel. The I-LinearStrobe luminaries are made available in a variety of linear luminary lengths; the most common being 12′ long. Common linear luminary lengths are 12′ (24 lineal feet of light per device), 15′ (30 lineal feet of light per device) and 18′ (36 lineal feet of light per device). These differing lengths for the I-LinearStrobe’s are designed to accommodate large or inordinately large doorways, double-door openings, doors with transoms overhead and/or doors with built-in side-light features. This embodiment of the LinearStrobe operates on the integrated (fire) notification appliance circuit’s 24v DC low-voltage power source(s) or, if used in security, is current limited and draws approximately 62.5mA (milliamps) from the NAC circuitry power source for its operation. Generally, I-LinearStrobes are integrated into building-wide fire alarm systems, are integrated–often zoned–alarms and are incorporated into the NAC similar in many ways to conventional fire alarm strobe light devices. The I-LinearStrobe can also operate on a 12v DC input and can also be hard-wired configured with and installed in a security alarm system or combo (fire and security combined) system. designed to fit any sized doorway or application. RoHS/Non-Phthalate Compliant & Manufactured under strict Certified ISO 9001 Standards. System Compatibility / Passive Device: The L-200Si EMVNA LinearStrobe™ device is designed and tested to be passive and compatible with other visible notification appliances in a system in a code-compliant synchronized 1 Hz. pattern. The device’s adjustable dip-switch allows the installer to field-calibrate the device to marry up with several modes/configurations and system types. 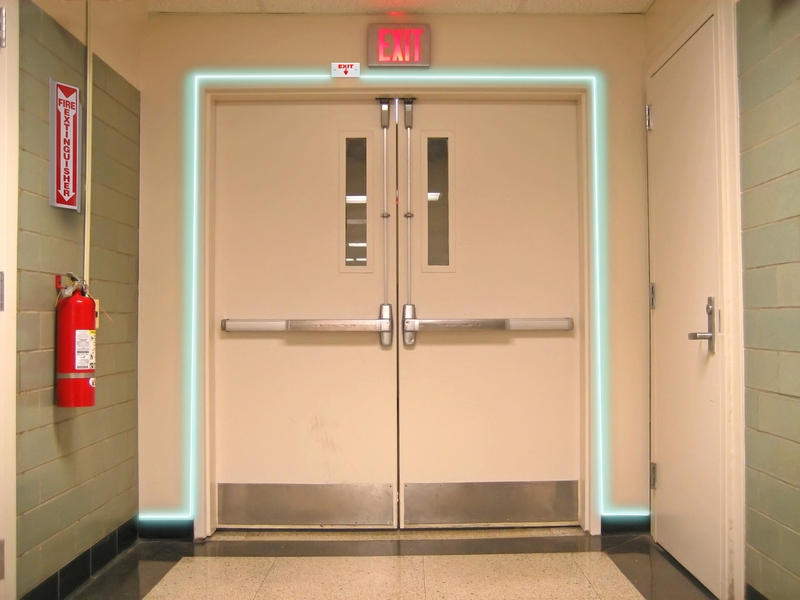 Serves the defined “purpose” of low-level exit signs, and does this with substantially more effectiveness given its fire panel integration and it’s visibility from any direction of approach.